Management Report Series No. 47. The purpose of this protocol is to mitigate the risks associated with the translocation of aquatic animals into, out of, or between recirculating aquaculture systems (RAS) in Victoria. The protocol considers the environmental risks associated with translocations and aims to improve the efficiency of the application and approval process. Consistent with the Guidelines for Assessing Translocations of Live Aquatic Organisms in Victoria (Department of Environment and Primary Industries, 2003), development of this protocol has been guided by a risk assessment. This document details the risk assessment process undertaken in relation to the translocation of aquatic animals grown in RAS and the protocols recommended for the translocation activities associated with RAS in Victoria. Translocation activities can be for the purposes of commercial aquaculture, research and development and/or for fish stocking. Further, a range of translocation activities are undertaken during the course of RAS operation and management (Figure 1). This protocol applies to the translocation of live aquatic organisms, including all stages of the organism's lifecycle, and specifies the conditions under which the organism can be translocated. The broad range of species and purposes associated with RAS results in overlap between this protocol and other finalised protocols. It is therefore important to define the scope of this protocol and the activities addressed in other translocation protocols. This protocol will be enabled through incorporation in relevant Aquaculture (Private Land) licences and general permits that contain conditions specifying compliance with the RAS Translocation Protocol. …self-contained farming systems that require minimal water exchange due to the internal recycling of water and use of biological and mechanical filters (Office of Regulatory Reform, 1999). have the capacity to be made biosecure. In addition, considerable understanding and characterisation of RAS has been gained through the development of the Best Practice Environmental Management Guidelines for Recirculating Aquaculture Systems (BPEMG) (Gavine et al, in press). The BPEMG links the wastes generated by RAS (e.g. uneaten feed, faeces, chemicals and therapeutants, fish mortalities, fish escapes and greenhouse gas emissions) with best practice management for new farms (e.g. site selection, farm design and construction) and existing facilities (e.g. operational management). This protocol identifies and ranks the risks associated with translocation of selected species that are currently or likely to be cultured in RAS. 1. Translocation of hatchery-reared seedstock from Victorian orinterstate hatcheries. - RAS for continued growout. 2. Translocation of hatchery-reared broodstock from Victorian orinterstate hatcheries. - RAS to be used as broodstock. 3. Translocation of broodstock from the wild. - RAS to be used as broodstock. 4. 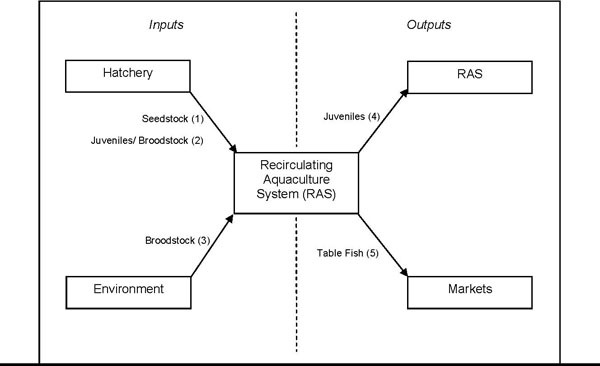 Translocation of advanced juveniles from RAS. - Other RAS for continued growout. 5. Translocation of live table fish. - Markets in Victoria, where the translocation is undertakenby the RAS operator. Broodstock: Animals retained for the purposes of breeding. This stock may be obtained from the wild and or conditioned on-farm and may be part of a selective breeding program. Competent veterinarian authority (CVA): The National Veterinary Services or other authority of a Member Country having the responsibility and competence for ensuring or supervising the implementation of the aquatic animal health measures recommended in the Aquatic Animal Health Code (OIE, 2006a). In Victoria, the CVA is the Chief Veterinary Officer, Biosecurity Victoria. Consequence: The outcomes of an event or situation (e.g. a loss, injury, disadvantage or gain) expressed qualitatively or quantitatively. Disease: Clinical or non-clinical infection where one or more of the aetiological agents of the diseases is listed in the Aquatic Animal Health Code (OIE, 2006a). Domesticated: Describes animals characterised by changes in behaviour, morphology or physiology brought about through cultivation and breeding under agricultural conditions. Endemic species: Species that occurs naturally within Victoria. Established species: Introduced species which are widely distributed and reproduce within a catchment or region. Fish: As defined under section 5 of the Fisheries Act 1995, all species of vertebrate aquatic fauna (other than mammals, reptiles, birds and amphibians) including sharks, rays, lampreys and other cartilaginous fish; oysters and other aquatic molluscs; crustaceans; echinoderms; and any species of aquatic invertebrate declared to be a fish by the Governor in Council. Genetically modified organisms (GMO): An organism whose genome has been modified using gene technology or that has inherited a trait(s) that has resulted from gene technology. For the purpose of this document, selective breeding and manipulation of chromosome number (i.e. ploidy) are not considered gene technology. Introduced species: Species which are not endemic to Australia. Likelihood: Probability or frequency of a particular event or situation occurring. Non-endemic species: Species which are endemic to Australia but not Victoria. Office International des Epizooties (OIE): Also known as World Organisation for Animal Health, an international inter-governmental organisation that collates and disseminates information on animal diseases and develops health standards for international trade in animals and animal products. Quarantine: Maintaining a population of aquatic animals for a specified period of time without direct or indirect contact with other aquatic animals for the purposes of observation and, if appropriate, testing and treatment. Quarantine may include appropriate treatment of the effluent. Recirculating aquaculture system (RAS): quaculture system that is characterised by being enclosed within a building or similar structure, relies substantially on water re-use, has the capacity for environmental control, employs dedicated mechanical and biological filtration and has the capacity to be made biosecure. Risk: Expose to a chance of loss or damage. Risk assessment: Process where estimates of the likelihood and consequence of an event are combined to arrive at a level of risk. Control methods are developed to reduce the risks. Risk rating: The chance of undesirable events, expressed as a function of the likelihood and consequence of such events. Translocation: The deliberate human-assisted movement of a live aquatic organism and associated transport media. Translocation Evaluation Panel (TEP): Expertise-based panel, established under the Guidelines for Assessing Translocations of Live Aquatic Organisms in Victoria, which evaluates proposed translocations and translocation protocols. Translocations described in this protocol are those authorised under the Fisheries Act 1995 and are subject to the Fisheries Regulations 1998. That is, the translocation is authorised under an aquaculture licence or a general permit. the Livestock Disease Control Act 1994, which is administered by the Victorian Department of Environment and Primary Industries (DEPI) Chief Veterinary Officer (CVO) and aims to control the introduction and spread of animal diseases in Victoria. The National Policy for the Translocation of Aquatic Animals – Issues, Principles and Implementation (Bureau of Rural Sciences, 1999) provides a risk assessment framework for adoption by all states and territories to assist in managing the risks associated with translocation. The Guidelines for Assessing Translocations of Live Aquatic Organisms in Victoria (Department of Environment and Primary Industries, 2003) provides the policy framework for implementing this policy in Victoria. Where translocations are likely to be repeated and have similar characteristics (e.g. species, associated media and source and destination locations), preference will be given to the development of translocation protocols that are consistent with the Victorian translocation guidelines. The DEPI has the lead role in developing protocols for the translocation of aquatic animals in Victoria. Proposals to undertake a translocation that conforms to a protocol will be considered on a case-by-case basis. Proponents must demonstrate compliance with the appropriate protocol through application for authorisations under the Fisheries Act 1995, i.e. a licence or permit. In 2005/06 there were 22 licensed commercial, three educational and one government research RAS facility in Victoria (Table 1). Several operators hold more than one licence thus authorising them to produce multiple species groups. Table 1. RAS in Victoria 2005/06 (Department of Environment and Primary Industries 2007; unpublished data). In terms of the number of farms and production volume, Murray cod (Maccullochella peelii peelii) and barramundi, (Lates calcarifer) are the principle species produced in Victorian RAS. Barramundi is a popular choice for aquaculture in RAS due to its relatively short production cycle, recognised market and tolerance to a range of water quality conditions. In recent times, production of shortfin and longfin eels (Anguilla australis and A. reinhardtii, respectively) has increased with most production exported to Asia. As the life-cycle of these species is not closed, glass eels, juvenile-stage or larger eels for stocking in RAS must be obtained from the wild or from other licensed producers. Small amounts of rainbow trout (Oncorhynchus mykiss), silver perch (Bidyanus bidyanus), golden perch (Macquaria ambigua) and yabbies (Cherax destructor) are produced in Victorian RAS facilities. A variety of species including Australian bass (M. novemaculeata), black bream (Acanthopagrus butcheri), sleepy cod (Oxyeleotris lineolata) and snapper (Pagrus auratus) have been trialled or produced in RAS for research and restocking purposes. Technological and economic efficiency improvements may lead to further expansion and development of RAS in terms of the numbers of sites and the range of species cultured. Production level. Approximately 71 per cent of RAS facilities produce less than ten tonnes per annum. All government and training facilities and most research and development facilities fall within this group. Nineteen per cent of RAS facilities produce between ten and 50 tonnes per annum and the remainder, 9.5 per cent, produce more than 50 tonnes per annum. Translocation of aquatic organisms is recognised as a potentially threatening process to the environment, particularly where species are translocated outside of their natural range. risks are appropriately managed and community confidence is maintained. In summary, this protocol considers translocation issues related to species classes as described under the risk categories below. The number and diversity of species grown in RAS makes assessment of the specific risks associated with individual translocations complex. While risk profiles associated with each species vary, species may be grouped into similar risk categories for management purposes. These categories are based on a preliminary screening of environmental risks including disease, genetic impact and history of establishing populations in Victoria and elsewhere. Risk category 1 (i.e. translocations of endemic species) represents a lower relative risk, whilst risk category 3 (i.e. translocations of non-established species) represents higher relative risk. In preparing this translocation protocol, a comprehensive assessment of the environmental risks of translocating live aquatic organisms to RAS was undertaken by an expertise-based risk assessment panel. The results of this risk assessment are summarised in the following section and fully described in Appendix A. The licence or permit holder is required to demonstrate the risk category that the species proposed for translocation falls within. This process begins with the submission of an Initial Screening Application to Fisheries Victoria in accordance with the Guidelines for Assessing Translocations of Live Aquatic Animals in Victoria (Department of Environment and Primary Industries, 2003). Examples of species in this category are listed in Table 2 and include endemic species obtained from, and translocated within, Victoria. The appropriateness of a species for inclusion in this category may be assessed by the Translocation Evaluation Panel (TEP) upon application. The appropriateness of a species for inclusion in this category may be assessed by the TEP upon application. Table 3: Examples of species in risk category 2. Examples of species in this category are listed in Table 4 and include species that are not established in a region or catchment. Table 4: Examples of species in risk category 3. A risk assessment was conducted according to the Department of Environment and Primary Industries Strategic Enterprise Risk Management Framework which is based on the Australian/New Zealand Standard for Risk Management (Department of Environment and Primary Industries, 2004; AS/NZS, 1995). Dr Nick Robinson. Senior Scientist, Animal Genetics and Genomics, DEPI (Genetics). The evaluation of specific risks associated with the translocation of aquatic animals grown in RAS was undertaken using standard risk assessment criteria. Risks were numerically ranked according to their likelihood and consequences, using standard risk assessment criteria and the numbers added to produce a risk rating (refer below). 5 Catastrophic Serious long-term or widespread environmental harm. the operator is authorised under the Fisheries Act 1995 to undertake aquaculture for commercial purposes. The results of the risk assessment are detailed in Appendix A of this document. The risk assessment process identified no high risks. This is not unusual given that RAS provide a relatively high level of biosecurity and operational and risk management control. Significant and moderate risks were identified in the risk categories related to disease and establishment of introduced and non-endemic populations. For each risk, proportionate translocation controls have been established. The introduction into Victoria of any of the notifiable diseases listed in Appendix D could cause severe biological and economic consequences to aquaculture and recreational fisheries. Two Office International des Epizooties (OIE) notifiable diseases are known to occur in Victorian waters: epizootic haematopoietic necrosis virus (EHN) and goldfish ulcerative disease (GUD). Viral encephalopathy and retinopathy, a disease caused by a nodavirus, formerly referred to as barramundi picorna-like virus, is common in barramundi and has been associated with mass mortalities of hatchery-raised juvenile fish. Although it has not been recorded in Victoria, it is considered a potential risk to aquaculture facilities and endemic species. The fungal disease epizootic ulcerative syndrome (EUS) occurs in fish from freshwater and estuarine systems and has been detected on one occasion in Victoria and eradicated. Outbreaks of EUS in New South Wales, east of the Great Dividing Range (Callinan, et al. 1999), have caused significant economic damage. Populations of introduced and non-endemic fish can result from escape or release of these species (Department of Environment and Primary Industries, 2003). Twelve introduced species, including European carp and mosquitofish (i.e. Gambusia sp. ), both declared as noxious species in Victoria, have become established in Victoria (Arthington, 1991). Both species have expanded well beyond the initial points of stocking or escape. Endemic species may also become established in areas where they are not naturally found. For example, Murray-Darling Basin species, including Murray cod, golden perch, silver perch, trout cod and Macquarie perch, have established populations outside of their natural range but have not extended significantly beyond the point of the original translocation (Cadwallader and Backhouse, 1983). species' food and habitat requirements. Prevention of escape is the most effective method for preventing the establishment of such populations. The inherent design characteristics of RAS (refer base case in previous section) minimise the likelihood of stock escape and resultant impacts of escaped species on endemic stocks. Thus, low and moderate risk can be effectively mitigated through adoption by licence and permit holders of industry-standard RAS design, operational controls (Appendix B) and disease management practises. These controls can be further adapted for the purposes of farming species of significant risk (Appendix C). For each translocation pathway, control measures specify minimum standards to manage environmental risks. All translocation records must be kept for a minimum of three years after the date of the last translocation event. 1.1. Meet RAS biosecurity measures as described in Appendix B.
or Obtain a certificate of stock health in accordance with Appendices G and H.
3.3. At least two business days prior to the proposed translocation, provide to the DEPI all transportation details for stock entering Victoria (Appendix F). 5.3. At least two business days prior to the proposed translocation, provide to the DEPI all transportation details for stock entering Victoria (Appendix F). 6.3. Meet additional RAS biosecurity standards as described in Appendix C.
7.4. At least two business days prior to the proposed translocation, provide to the DEPI all transportation details for stock entering Victoria (Appendix F). 8.2. Disposal of aquatic species during or following a translocation event must be undertaken in accordance with the relevant legislation. This translocation protocol was developed by the DEPI with input from a range of industry and government stakeholders. In drafting the document, specific mention should be made of the contributions of Anthony Forster, Fiona Gavine, Peter Lawson and Bill Lussier. Dr Tracey Bradley, Principal Veterinary Officer Aquatic Animal Health, DEPI, provided important input during the preparation of this protocol. The invaluable contribution of the expert risk assessment panel also deserves mention: Dr Mehdi Doroudi, PIRVic; Mr Wayne Fulton, PIRVic; Dr Paul Hardy-Smith, Panaquatic Health Solutions Pty Ltd; Dr Paul Harrison, Mainstream Aquaculture; Dr Brett Ingram, PIRVic; and Dr Nick Robinson, PIRVic. Arthington, AH (1991). Ecological and genetic impacts of introduced and translocated freshwater fishes in Australia. Can. J. Fish. Aquatic. Sci., Vol. 48 (Suppl. 1), 1991. AS/NZS (1995). Australian/New Zealand Standard for Risk Management (AS/NZS 4360:1995). Standards Australia/Standards New Zealand. Atwood, HL, Tomasso, JR, Webb, K and Gatlin, DM. III (2003). Low-temperature tolerance of Nile tilapia, Oreochromis niloticus: effects of environmental and dietary factors. Aquaculture Research, 2003, 34, 241-251. Bureau of Rural Sciences (1999). National Policy for the Translocation of Aquatic Animals – Issues, Principles and Implementation. Fisheries and Forestry Science Division. Canberra. Cadwallader, PL and Backhouse, GN (1983). A Guide to the Freshwater Fish of Victoria. Victorian Government Bookshop, Melbourne, Victoria. Callinan, RB, Rowland, SJ, Jiang, L and Mifsud, C (1999). Outbreaks of epizootic ulcerative syndrome (EUS) in farmed silver perch Bidyanus bidyanus in New South Wales, Australia. In: World Aquaculture Society (1999). The Annual International Conference and Exposition of the World Aquaculture Society. Book of abstracts. 26 April – 2 May, 1999. Sydney. p127. Department of Agriculture, Fisheries and Forestry (2005). National list of reportable diseases of aquatic animals (August 2005). Department of Agriculture, Fisheries and Forestry, Commonwealth of Australia. Department of Agriculture, Fisheries and Forestry (2006). A Strategic Approach to the Management of Ornamental Fish in Australia: Consultation. Marine and Coastal Committee, Natural Resource Management Ministerial Council, 2006. Bureau of Rural Sciences, Commonwealth of Australia. Department of Environment and Primary Industries (2003).Guidelines for the Translocation of Live Aquatic Organisms in Victoria. Department of Environment and Primary Industries Melbourne, Victoria. Department of Environment and Primary Industries (2004). Strategic Enterprise Risk Management Framework. Department of Environment and Primary Industries, Melbourne, Victoria. Department of Environment and Primary Industries (2005). Protocols for the Translocation of Fish in Victorian Inland Public Waters. Fisheries Report Management Report Series No. 24. Department of Environment and Primary Industries, Melbourne, Victoria. Department of Environment and Primary Industries (2006). Victorian Protocol for the Translocation of Eels. Fisheries Report Management Series No. 27. May 2006. Department of Environment and Primary Industries, Melbourne, Victoria. Department of Environment and Primary Industries (2007). Fisheries Victoria Commercial Fish Production Information Bulletin 2006. Primary Industries Research Victoria, Queenscliff Victoria. Gavine F, Larkin B, and Edwards M (in press). Best Practice Environmental Management Guidelines for Recirculating Aquaculture Systems. Fisheries Victoria Research Report Series No. 27. Department of Environment and Primary Industries, Melbourne, Victoria. OIE (2006b). Manual of Diagnostic Tests for Aquatic Animals. Fifth Edition, Office International des Epizooties, 2006, Paris, France. (www.oie.int).Office of Regulatory Reform (1999). Final Report: Office of Regulatory Reform Task Force Review of Regulatory Arrangements in the Victorian Aquaculture Industry. Office of Regulatory Reform, Melbourne. 55 pp. The primary objectives in developing this translocation protocol are to preserve the natural and farmed stocks of Victorian aquatic animals and to ensure that translocations do not adversely impact Victorian inland waters. In accordance with the Guidelines for Assessing Translocations of Live Aquatic Organisms in Victoria (Department of Environment and Primary Industries, 2003), a risk assessment panel was convened to identify and assess the risks of introducing diseases and the environmental/ecological consequences of translocations. Refer to the section of the protocol entitled Summary of risk assessment process for more details on the risk assessment process. Impact of transient species (short-term impacts) Escaped native1 species could outcompete, displace, prey on, or alter the habitats of native fish species. 3 2 5 (Moderate) These issues are related to the short-term impacts of escaped fish, whereas the establishment of feral populations is a long-term impact. Impacts will depend on the number of escapees and frequency of escapes. This category does not cover recruitment – only the impacts of individual escapees. As escape from RAS is unlikely and such systems are usually isolated from watercourses, impacts (and therefore consequences) are likely to be localised. Short to medium-term impacts depends on species longevity. It is also likely that fish cultured in RAS will be less well adapted to the Victorian environment than wild fish. Escaped introduced species could outcompete, displace, prey on, or alter the habitats of native fish species. 3 2 5 (Moderate) In this context "introduced" species includes native fish outside of their natural range. Again, impacts will depend on number of escapees and frequency of escapes. Likelihood of escape from RAS is low and impacts will occur only if significant numbers are lost. Escaped nonendemic species could out-compete, displace, prey on, or alter the habitats of native fish species. 3 2 5 (Moderate) The impact of non-endemic species will be species specific and there is a need to consider its ability to adapt, its longevity, thermal tolerance and feeding habits, as well as other factors. In general, temperate species would be expected to last longer than tropical species. Feral populations Escape of native finfish and yabbies translocated outside of their natural range could establish populations outside of their natural range. 1 4 5 (Moderate) A feral population was defined as a self-sustaining population. All life forms of the species must be considered. Where native fish have been translocated outside of their natural range in the past, feral populations have been established. However, feral native fish populations tend to remain local to the point of translocation rather than spreading widely (but there are no hard and fast rules about this). The consequences of feral populations being established will depend on the circumstances of the translocation. A score of 4 (major) would be the worst case scenario. Feral populations Non-established, non-endemic species translocated into Victoria could establish feral populations. 1 5 6 (moderate) Depends on the nature of the translocated fish, their environmental requirements and the receiving environment. Barramundi would be unlikely to survive and breed. However, there are concerns that tilapia could adapt to cool temperatures. Temperate non-endemic species would generally be considered a higher risk than tropical species. This risk could also include non-endemic (to Victoria) strains of native species. Risk depends on the genetic structure of wild populations, numbers of escapees and extent of genetic difference between wild population and escapees. Events like this could cause some allele differences, but what would be classified as a significant genetic difference? Factors to consider when assessing this risk includes the number of escapees, likelihood of survival and reproduction, number (and fertility) of viable offspring. Does this apply to genetic shifts to feral/introduced populations as a consequence of escaped native populations? Likelihood of genetic shift occurring as a result of this translocation is low. However, the consequences if a large genetic shift did occur could be significant. It is possible that the long-term genetic impact will be low as natural selection will favour animals with a genetic makeup that is well suited to the local environment and these animals are likely to be ones with a similar genetic makeup to that which existed in the wild population before the event. Golden perch sub-species or strains (external to MD basin) could also be used in farms. Similarly, different strains of silver perch east and west of the divide. Onus on proponent to prove strain of stock. Also, translocation of Murray cod within their natural range could impact on the genetic integrity of trout cod populations (hybridisation). Likelihood is still scored as low, as escaped fish will not be as well adapted as wild fish. Consequences will be major if it does happen. Escaped fish will be different from wild populations but it is still unlikely that they could survive and breed in sufficient numbers to cause genetic shift. Selection/domestication in the RAS environment could make it less likely that escaped fish would survive and breed in the wild. Depends on traits selected, intensity of selection and extent of inadvertent selection for particular traits. e.g. carp, redfin, rainbow trout. Risk depends on genetic structure of wild populations of the translocated species. Factors that should be considered include number of escapees as well as likelihood of survival, reproduction, number (and fertility) of viable offspring. Likelihood of it occurring is rare. Consequences if it did occur would be significant. Could revert back over time due to natural selection because the genetic makeup of the wild population is likely to be the best adapted to the natural environment. Likelihood is still low as fish will not be as well adapted as established fish. Consequences will be major if it does happen. Escaped fish will be different from wild but still unlikely that they could survive and breed in sufficient numbers to cause genetic shift. Selection/domestication in the RAS environment may make it less likely that escaped fish could survive and breed in the wild. Depends on traits selected, intensity of selection and extent of inadvertent selection for particular traits. Disease status of facility and source stock known Release and establishment of disease from native fish. 1 2-3 3-4 (Low) This risk relates to the release and establishment of disease through the escape of fish or water. Release and establishment of disease from introduced fish. 1 2-3 3-4 (Low) This risk relates to the release and establishment of disease through the escape of fish or water. Release and establishment of disease from non-endemic fish. 1 5 6 (Moderate) Likelihood is low but consequences are major/catastrophic. With nodavirus, may depend on age. Presumes thorough testing and no diseases of concern detected. Disposal of water results in transfer of infectious water to the environment 1 2 3 (Low) Likelihood is low due to good knowledge of health status. Disease status of facility and source stock unknown Release and establishment of disease from native fish. 2 3-4 5-6 (Moderate) Consequence is higher due to lack of data – default to worst-case scenario. Release and establishment of disease from introduced fish. 2 4-5 6-7 (Moderate-significant) Potential for viral diseases e.g. Epizootic haematopoieticnecrosis (EHN). Release and establishment of disease from non-endemic fish. 2 5 7 (Significant) Environmental conditions not conducive to spread of barramundi picorna-like virus (BPLV), but could be conducive in summer. B1. Farm screens, barriers, nets, sluices or other equipment designed to contain fish within the farm must be securely fastened in place, in proper working order and an appropriate size to prevent fish escape. (e.g. there can be no direct discharge to surface waters). B3. Ensure that accumulated organic matter (e.g. faeces, uneaten feed, mortalities and fouling organisms) in culture units does not compromise stock health and contribute to an increased risk of disease. B4. Dry out and or disinfected culture units between consignments of stock. B5. Regularly inspect, clean and, where possible, disinfect waste water outlet channels and pipes. B6. Foot baths must be provided at key locations and maintained to provide effective disinfection at all times. B7. Remove dead and moribund stock from the culture units as soon aspractical but at least daily. B8. Dispose of all mortalities in a manner consistent with relevant legislation. B9. Equipment, protective clothing or footwear that will contact stock or water used to hold stock must be cleaned and disinfected prior to use (Appendix I). B10. Footwear worn by staff and visitors within the RAS facility should not be removed from the facility. B11. Use dedicated equipment and/or protective clothing for specific areas (e.g. broodstock, nursery, growout) of the site. B12. Restrict staff movement to those areas where they undertake regular duties. B13. To minimise contamination risk, restrict or control public access and movement throughout the aquaculture site. B14. Undertake daily inspections of aquaculture stock for disease, morbidity or unusual behaviour which may indicate the presence of disease. B15. Retain accurate records including: the number and species of stock held in each culture vessel, stocking rates, mortalities, incidence of significant stressors and observations of fish health. B16. Maintain an accurate record of all translocation movements to and from the aquaculture site including: the location and contact details of the supplier or receiver, date of supply and the numbers and species of stock translocated. B17. Records must be kept for three years after the date of the last entry. B18. In the event of significant mortality2 or suspected disease the licence holder is required to inform DEPI within 24 hours. B19. On request, make available to DEPI samples of the infected stock for the purpose of pathological examinations. B20. To lower the risk of cross-contamination, translocated stock must be quarantined or kept separate from resident stock for a minimum period of three weeks after arrival. Quarantine or separation involves maintaining stock in individual growing units, using dedicated equipment (e.g. nets, cleaning equipment) and controlling access by personnel. In addition to the general RAS biosecurity standards specified in Appendix B, the following standards are required for RAS in which non-endemic species are stocked. Relevant disinfection, containment and transport procedures are discussed in Appendix I.
C1. Fish should be transported in accordance with OIE disinfection, transport and containment procedures. Transport media used for the translocation of non-endemic fish species must be disinfected according to standard OIE procedures. C2. Hand-washing basins will be located at all key access points and staff must disinfect hands prior to exiting the facility. C3. The aquaculture facility must be located above the 1 in 100 year flood level. C4. The aquaculture facility must be located a sufficient distance from permanent or intermittent waterways to minimise the risk of stock escape or transfer of disease from the facility. For the DEPI to assess the location of the facility, the applicant must submit a detailed site plan showing: proximity of surface waters, land use, surface topography, nature of vegetation and any other relevant information. C5. The aquaculture facility shall be fully enclosed with a non-permeable floor capable of being cleaned and disinfected. C6. The aquaculture facility will be designed to reduce the likelihood of contamination by and movement of vermin that may provide a vector for disease transfer. C7. A waterproof bund wall of sufficient height to retain the total volume of water contained within the facility is required to prevent its accidental release into a waterway. C8. The facility must be designed to ensure there is no discharge of untreated liquid effluent outside of the RAS facility. All solid and liquid wastes will be disinfected according to the standard OIE procedures. C9. No barramundi eggs or larvae shall be transported into Victoria. C10. All barramundi fingerlings must be greater than 42 days old prior to translocation into Victoria. C11. Hatchery production of barramundi will not be permitted within on-growing facilities. Diseases of finfish listed as notifiable and reportable (Department of Agriculture, Fisheries and Forestry, 2005; OIE, 2006a; Livestock Disease Control Act 1994 (Victoria). (iv) reduce potential impacts to the environment. E2. All fish health surveillance program(s) referenced in this protocol refer to those that fulfill the requirements in AQUAPLAN or World Organisation for Animal Health manuals. E3. It is recommended that licence holders wishing to prepare a fish health surveillance program seek endorsement of their program from the DEPI. E4. AQUAPLAN is Australia's National Strategic Plan for Aquatic Animal Health. It is a broad comprehensive strategy to build and enhance capacity for the management of aquatic animal health in Australia. E5. The World Organisation for Animal Health provides internationally recognised standards for developing and implementing targeted fish health surveillance programs for aquaculture businesses. E6. Prior to developing a fish health surveillance program, it is recommended that licence holders review AQUAPLAN and Chapter 1.1.4 "Requirements for surveillance for international recognition of freedom from infection" in the Manual of Diagnostic Tests for Aquatic Animals (OIE, 2006b). E7. The DEPI criteria for assessing fish health surveillance programs will be drawn from AQUAPLAN and World Organisation forAnimal Health manuals. declare * that there have been no notifiable diseases or unexplained disease outbreaks at the above facility during the past twenty-four months. * Section 7 of the Livestock Disease Control Act 1994 (the Act) provides that a person who knows or has reason to suspect that a disease is present in fish must notify an inspector of stock authorised under the Act. Penalty: 240 units or two years imprisonment or both, in the case of an exotic disease; 120 penalty units or one year imprisonment or both, in the case of any other disease. Provide details regarding the transportation of animals in Victoria including the mode of transport, flight details, courier/carrier name, address, telephone/fax contact details and consignment number if relevant. A visit to the premises by the approved veterinarian to inspect the health status of the stock for the presence of clinically abnormal fish and a review of relevant farm records4 and farm biosecurity. Where there has been no previous pathological testing of stock, pathological examination of stock that would enable, at the 95% confidence level, certification that a notifiable disease is not present in the population of animals tested, based on an assumed pathogen prevalence of 2% or above. Fish for this sampling must be collected by the approved veterinarian at the time of the visit to the premises. Bias in the sampling should be made towards animals showing clinical signs of disease or showing signs of weakness when handled (i.e.moribund). For a single batch test, the sample numbers required for these default values (i.e. 95% confidence, 2% prevalence) are provided in Table 1, Chapter I.1 and I.3 of the OIE Manual of Diagnostic Tests for Aquatic Animals (2006b), i.e. 150 animals for these parameters 5. Historical pathological testing of stock can provide useful information and can be used as evidence in certifying freedom from disease. The usefulness of this information depends on several factors including the premises' biosecurity measures during the relevant historical period and whether the animal populations to be translocated were part of a formal health monitoring and surveillance program. The approved veterinarian may elect to reduce the number of stock sampled for pathological testing based on assessment of the historical information. G2. Notifiable diseases (Livestock Disease Control Act 1994) may not be relevant to all of the species for which authority to translocate is sought. The approved veterinarian is required to identify the notifiable diseases relevant to the species for which the stock health certificate is issued and demonstrate that the sampling methodology is appropriate for those notifiable diseases. G3. All stock, including larvae, to be translocated from licensed interstate aquaculture sites, must be accompanied by a statement from the supplier detailing the steps taken to eliminate non-specified species from the consignment and signed by the responsible licence holder or delegate. G4. The certificate of stock health will be valid for a maximum period of two weeks from the date of issue and will be invalidated if there is evidence of disease, significant or unexplained mortality, and/or co-mingling with other stock that may compromise the health status of the batch. Section 7 of the Livestock Disease Control Act 1994 (the Act) provides that a person who knows or has reason to suspect that a disease is present in fish must notify an inspector of stock authorised under the Act. Penalty: 240 units or two years imprisonment or both, in the case of an exotic disease; 120 penalty units orone year imprisonment or both, in the case of any other disease. The following sections should be completed and signed by the certifying veterinarian. Please use extra paper if required. 13. Details of site inspections including dates that you have conducted or are aware of. 14. Details of facility aquatic animal health status including health surveillance during the previous two or more years and history of disease or eradication in the area. 15. Details of any quarantine/treatment/disinfection undertaken before shipment. 16. Details of disease zoning issues (e.g. zoogeographic area such as the Murray-Darling system) if present. To the best of my knowledge, I certify that the proposed consignment of fish is free of notifiable diseases (Livestock Disease Control Act 1994). Disinfection is an important operational control to manage the risks associated with infectious disease. Routine or targeted disinfection can assist with the eradication or exclusion of specific diseases associated with aquaculture establishments. 11. Vehicles and equipment shall be thoroughlycleansed and disinfected before and afteruse according to the guidelines given in theAquatic Animal Code (OIE, 2006a). 12. Vehicles and/or containers in which aquatic animals are confined should be secured to maintain optimal conditions for the aquatic animals during transport and to allow easy access by the attendant. 13. The waste and rinsing water should not be emptied into a drainage system that is directly connected to an aquatic environment where aquatic animals are present. 14. The water from the tanks should be disinfected by a recognised process (OIE,2006a) and either discharged to mains sewer or sprayed over land that does not drain into waters containing aquatic animals. Following are some of the processes applicable to disinfection in recirculating aquaculture systems (modified OIE, 2006a). Other disinfecting agents may be suitable and should be used according the instructions of the manufacturer. Calcium hypochlorite Bacteria and viruses on all clean surfacesand in water 30 mg available chlorine/litre. Leave toinactivate for several days or neutralisewith sodium thiosulfate after 3 hours Can be neutralisedwith sodiumthiosulfate. Ozone Sterilisation of water, fish pathogens 0.2–1 mg/litre for 3 minutes Equipment used toproduce ozone is costlyand ozone is verytoxic. Sodium hypochlorite Bacteria and viruses on all clean surfacesand in water 30 mg available chlorine/litre. Leave toinactivate for a few days or neutralisewith sodium thiosulfate after 3 hours. Can be neutralisedwith sodiumthiosulfate. Nets, boots and clothing 200 mg to 1 g available chlorine/litre forseveral minutes. Leave to inactivate for afew days or neutralise with sodiumthiosulfate. 1 For the purposes of Appendix A, native refers to species found naturally within Victoria. 2 Significant mortality is stock losses (per culture unit) in excess of 1.0% per day. 3 To be DEPI-approved, a veterinarian must be qualified andexperienced in aquatic animal health management. 4 Records will include the number (and species) of stock held ineach culture vessel, stocking rates, mortalities, incidence ofsignificant stressors and other fish health observations.